Love the stirring hymns of the Getty's? 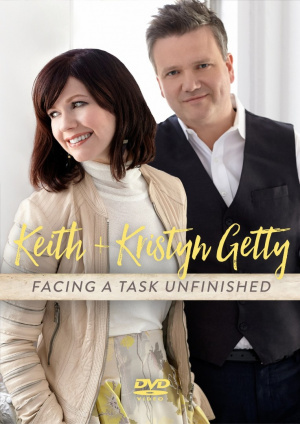 Facing a Task Unfinished DVD is the accompanying DVD for the latest album from pre-eminent modern hymn writers, Keith and Kristyn Getty. The album, which champions congregational singing and mission, follows the radical example of the hymn Facing a Task Unfinished, rewritten from its original 1931 version, where its urgent call propelled individuals, families and churches to global witness. This studio album features the Gettys band, live congregational singing, and fresh global sounds as well as guest appearances by John Patitucci, Fernando Ortega, Ladysmith Black Mombazo and artists from around the world. Keith and Kristyn Getty are renowned modern hymn writers from Northern Ireland. One of Keiths most popular compositions, In Christ Alone, (co-written with Stuart Townend) is the #1 most-sung hymn in the UK since 2006 (CCLI) Songs from the Getty catalogue are sung by an estimated 100 million people annually in churches around the world. The duo has released multiple albums and performed at notable venues as diverse as Londons Royal Albert Hall, Carnegie Hall, and the Grand Ole Opry. The Gettys met in Belfast, Northern Ireland when they began songwriting together. They were married in 2004, and two years later, they recorded their first project as a couple in the United Kingdom and Nashville, TN. In 2006, they made the journey overseas to America and lived in Ohio for three years as they began their professional career.They moved to Nashville in 2010. Facing a Task Unfinished DVD by Keith and Kristyn Getty was published by Integrity Music in October 2016 and is our 557th best seller. The ISBN for Facing a Task Unfinished DVD is 0000768677919. Lovely album... great songs & performance by Kristyn & band! Got a question? No problem! Just click here to ask us about Facing a Task Unfinished DVD.